PRE-CONFERENCE/ONLINE REGISTRATION CLOSED ON FRIDAY, SEPTEMBER 21, 2018. IN-PERSON REGISTRATION, AS SPACE ALLOWS, WILL BE AVAILABLE AT CONFERENCE CHECK-IN ON SEPTEMBER 27-28-29. Registration for the fourth quadrennial Race & Pedagogy National Conference, September 27-29, 2018, is open. The full registration amount will be $400; single day (either Friday only or Saturday only) registration will be $250. The group rate for 10 persons is $2500 and $250 for each person beyond the first ten. The student rate for non-Puget Sound students is $250 for the full conference. Scholarship funds. This enacts a main tenet of the Race & Pedagogy Institute that cost should not be a barrier to conference engagement, and thus significant work is being done to raise funds. 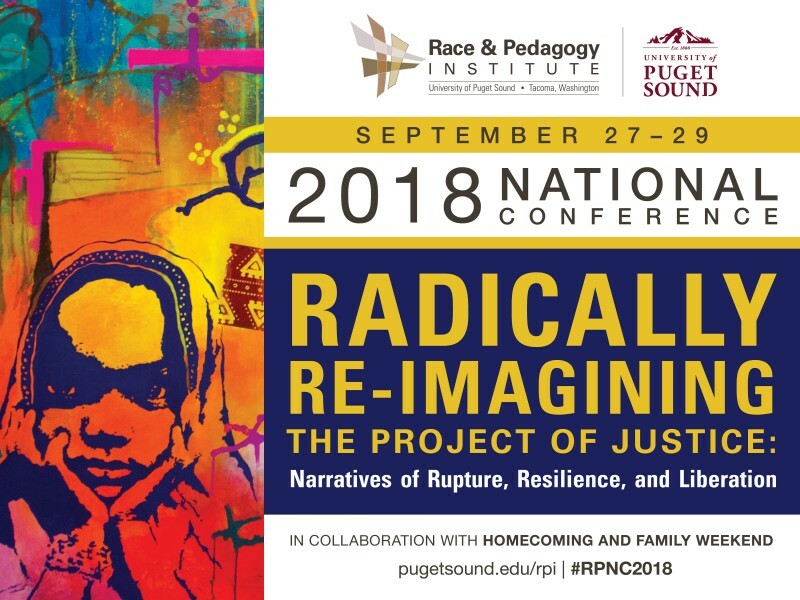 To be notified of conference updates and other Race & Pedagogy Institute happenings, please send email to raceandpedagogy@pugetsound.edu with Add to Mailing List in the Subject line.